We have developed a mobile-agent based network monitoring system. In this system, multiple agents coordinate with each other to collectively perform network monitoring. This paper deals with the coordination of multiple agents to achieve monitoring functions and failed component recovery. We also address the security needs of our monitoring system, i.e. types of attacks that could be launched on the system, and our solutions to thwart them. Finally, we present our experiences with the system and the resource overhead imposed by it. This work was supported by National Science Foundation grants ANI 0087514 and EIA 9818338. Harrison, C.G., Chess, D.M., Kershenbaum, A.: Mobile Agents: Are they a good idea? Technical report, IBM Research Division, T.J.Watson Research Center (1995) Available at URL http://www.research.ibm.com/massdist/mobag.ps. Allen, J., Christie, A., Fithen, W., McHugh, J., Pickel, J., Stoner, E.: State of the practice of intrusion detection technologies. 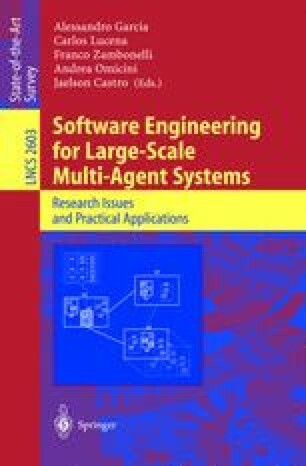 Technical Report CMU/SEI-99-TR-028, Software Engineering Institute, Carnegie Mellon University (2000) Available at URL http://www.sei.cmu.edu/.